Product Description: There are many types and shapes of arm rests. The one shown in the photo to the left was purchased because it had an indentation where the door could be closed by pulling from its inside. It also had a visual appeal that matched the inside of the door design. 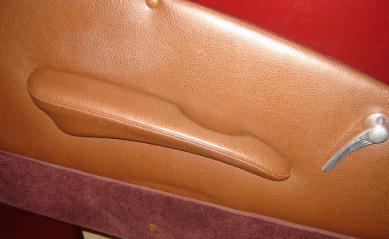 After purchasing, the arm rest was taken to an upholstery shop to have it covered. Its position on the door is somewhat important. Before attaching, it should be tried in several positions with the driver in the vehicle, until the best position is found and marked accordingly.